Did you know that your body is made up of more protein from collagen than any other protein? It’s essential to your health. Yet, most people are not getting the collagen they need from their diet alone. …along with a stronger, healthier, and more youthful body. Most, who supplement protein, use dangerous protein powders like whey protein or soy protein. Whey protein contains significant amounts of inflammatory and thyroid-suppressive amino-acids like tryptophan. Soy protein is estrogenic, which also suppresses thyroid function. Don’t throw hard earned money down the drain buying protein supplements that worsen your thyroid condition. Collagen is rich in the amino-acid glycine, which provides potent anti-inflammatory benefits. And by balancing other thyroid-suppressive amino-acids, it helps promote healthy thyroid hormone production. In other words, it’s the ideal protein for your thyroid. My collagen protein powder is in the form of Collagen Hydrolysate. It’s made using a special enzymatic process to give you a pure, no-odor neutral-tasting, and easily digestible protein. It requires no preparation and contains more protein than bone broth. And unlike other gelatin supplements, collagen protein powder easily dissolves in both hot and cold liquids. You can add it to your coffee, juice, water, smoothies, and more… like my clients do. But the best part is that it comes from happy, healthy, 100% grass-fed and pasture-raised cows. At Forefront Health, I specially source and formulate our supplements for optimal thyroid function, using only the purest ingredients for best results. Contains 1 lb. 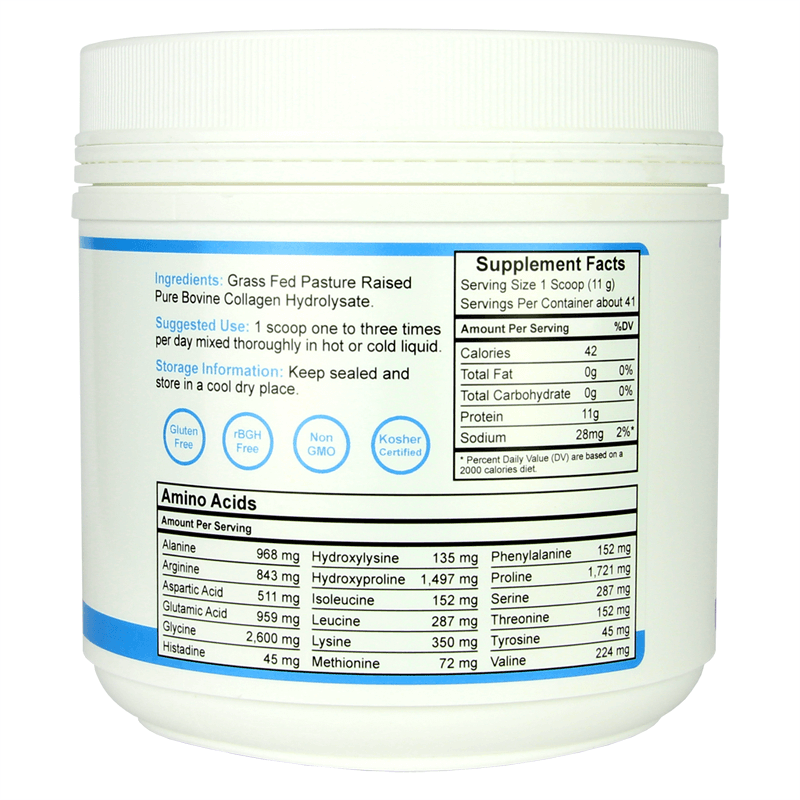 (454 g) of grass-fed, pasture-raised, pure, clean, and kosher collagen protein powder. Suggested Use: 1 scoop one to three times per day mixed thoroughly in hot or cold liquid. Add it to just about any baking dish or desert to increase the protein content. Use it pre-, during-, and post-exercise. Use it to replace other harmful protein powders. 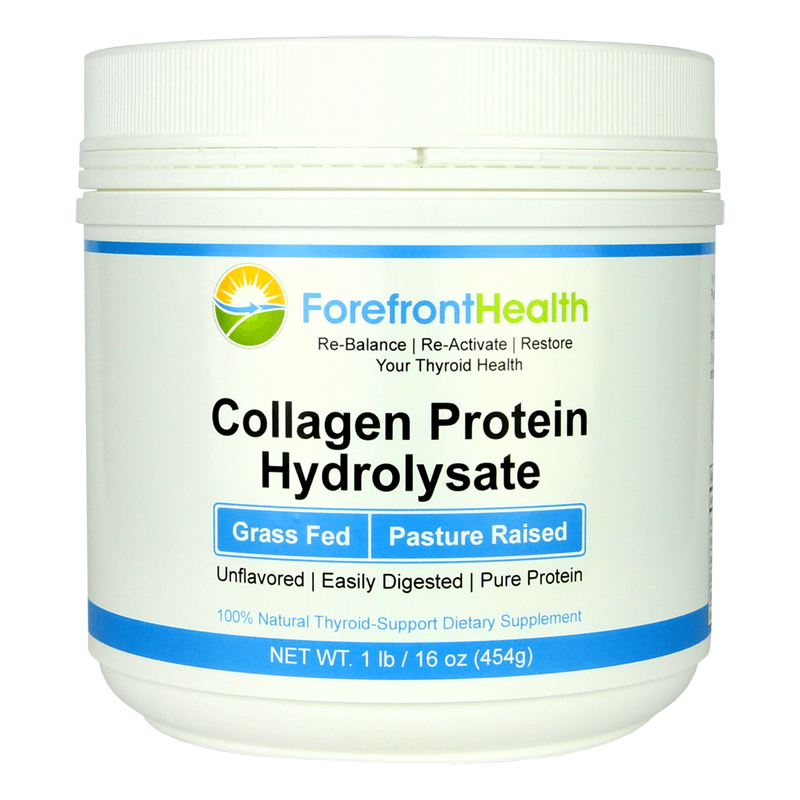 Our Collage Protein Powder is in the form of Collagen Hydrolysate. Thanks so much TomB For this excellent product! I had tried four other types of collagen supplements over the last seven years after car accident causing neck injury.. I then found your stuff and couldn’t believe the difference in the strength of my neck. I also really enjoyed how it didn’t clump up in my “balanced coffee” at breakfast. My son also enjoyed hire it didn’t change the flavor of his balanced tea. So, when you said this product was even better,I must admit I was a bit skeptical — not anymore! After just two days of this new one,I can feel more strength in my neck!!! I also can’t believe how it’s even finer than the other one of yours and I’ve experienced absolutely no coagulation at all!😬 Thanks again for another superior quality product which works like a charm! Great collagen brand. Thank you for making this product. I had tried some of the other brands and made sure to use only the ones that came with most promises. I had to admit your brand goes above and beyond. i even give it to my 2 and half year old daughter for nutrition and better bowl habits. I love that it quickly, easily, and completely dissolves. An excellent product! What I notice is that my sleep has improved tremendously. I fall asleep instantly and I do not wake up until the next morning. My hair is growing in leaps and bounds. There is also a noticeable improvement in skin and nails. In addition I am no longer constipated. My bowel movements are without strain. This is the best protein product on the market. It is definitely a winner with 5 stars. I haven’t used Collagen protein very long but in this short time I am noticing my hair and nails are stronger and growing better than they have in years. I would recommend this product to any of my friends. 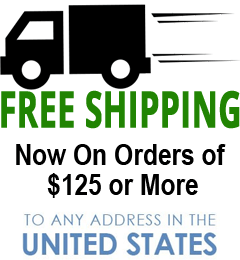 I have been using the collagen protein for about 6 weeks and just placed a second order. I love how it is so easy to use and disolves so well. I am noticing its benefits in my skin, hair and nails but my greatest joy is the improvement with hip and knee and back pain as well as inflammation. I had no idea it would improve my day to day activities like it has. I highly recommend this product. Dissolves better than most gelatins I’ve purchased. Great product! Thank you great product; using it in green smoothie; will have to try in bit of coffee; will be great to see when doing osteopenia scan to see my numbers show ok.
package seems fine easy to open and seal again. Absolutely, Love this product. you don’t even notice it in the balance coffee. Love this collagen powder. It dissolves quickly and easily into hot and cold beverages. Plus, it is tasteless. It’s the best collagen powder I’ve tried. Highly recommend it. Absolutely love this collagen protein. The skin on my face feels firmer, and the joint pain that goes along with Hashimotos has improved greatly also. It dissolves easily in my coffee with no difference in the taste. I also add it to soups, and it improves the texture of gluten free baked goods too! I have had no problems ever with the package re-sealing. Thank you for such a high quality grassfed product. I don’t even have enough words to tell you how surprised and over joyed I am with the changes and improvements I am seeing on myself, like my skin, hair, nails, my joints, bowel movements you name it the list can just go on and on, and I have been using your collagen protein for the last eight months and I am so extremely happy and proud of receiving all the nice compliments about my looks and skin etc. Unbelievable how much better I feel! I have noticed reduced joint pain, better elimination and no more IBS like symptoms and my skin and hair are healthier. It’s hard to believe the results and benefits of this one supplement but I guess that just demonstrates how much I needed the nutrients. And I have only used one package so far so definitely reordering right now! This also tastes great in my coffee! First time I tried it. Dissolved so quickly and absolutely no taste in a cup of coffee. I have tried other collagens and they seem to always have some flavor. Not this one. Hoping it has the desired side effects for me after long term use. How much are people taking per day to see the results they are? I just bought it for the first time , it dissolved quickly without taste . I bought it for Thyroid and hair support .. Having an underactive Thyroid and on NatureThroid meds, I hope this product will help me. Disappointed that this product lists nothin as far as the type of collagen used. Collagen 1, 2, and 3 have different purposes in the body but I’m not sure which one or combination I’m ingesting. Unfortunately, that just occurred to me. Taste isn’t bad, smell is there but not bad. Let’s see how it goes. Hi Sarah, I’m happy to help. Much of the talk about collagen types is a bit misleading. 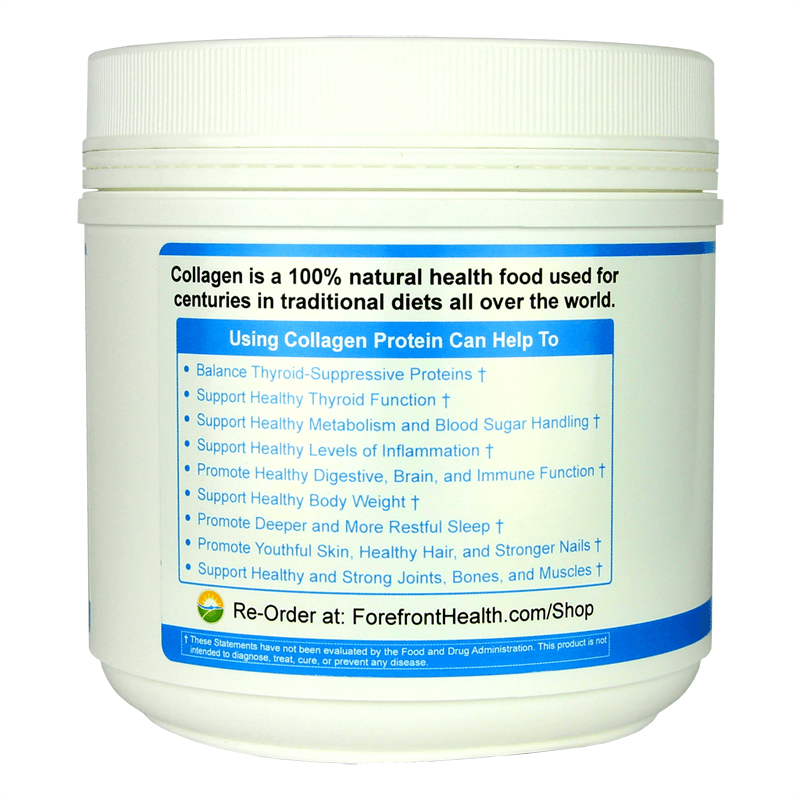 The collagen type is not relevant for our purpose in using it (to improve thyroid function). But, it would be predominantly type I, which is the most abundant in the human body and what studies show people are truly deficient in. Thank you for making this product! Whenever I tried other collagen products, I always ended up feeling more hypothyroid than before. Not with this collagen. I love that I mix it with my smoothie every morning and can’t tell the difference in taste or appearance. My hair was thinning before and I was full of premature wrinkles. It’s amazing that I’ve seen a difference in one month, my skin is clear and firmer. I have new hair growth and have been getting compliments as to how shiny it looks! I love this product, I will continue to use it, and I highly recommend it! This collagen is wonderful! I am sensitive to many things but this product gives no side effects. I have noticed after five days, my skin feels extra smooth and hair has a thicker feeling to it. Praying for improved gut health. Will update in a few weeks. Excellent product! This is an amazing product. I am one who does not get much protein and with this product it makes me feel like I am allowing my body something good that it needs. This product is absolutely wonderful and amazing. It’s exactly what my body needed to hit some kind of reset button that I don’t understand at my age of 69. I have lost 25 pounds and my thyroid medicine has been cut in half! I will continue to use it! I’m getting ready to place my 4th order. I am very happy w/ this product. I noticed results right away. I am sleeping better and I have more energy. I am more regular as well. I have been using this for about 3 weeks and I have noticed improvements in those areas. It has also helped w/ my brain fog. I feel more clear headed. I highly recommend this. Thanks, Tom. This product definitely dissolves well. It has already started to help my facial skin and nails! im loving this collagen protein powder.WOW it makes my pain go away quite a lot.so happy cant wait to reorder soon. I too have tried various collagen powders but found this one to be my favorite for many of the reasons already mentioned. Plus, the packaging is much stronger and sealed more tightly than that of other collagen powders, which I appreciate. Great product, mixes excellently in hot or cold liquid. No texture, no flavour in the coffee I tried it in. Would appreciate some guidance on how to measure/work out how much to take. 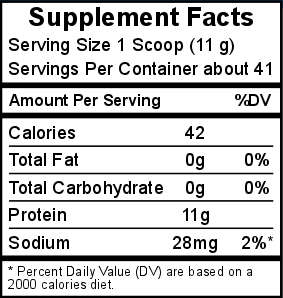 It says 1 scoop (thought scoop would have been provided) so how does 11g equate to teaspoon/tablespoon etc in terms of knowing how much to take. Regards. Have been taking some and seems promising so far. Hi Judith, The collagen does contain a scoop inside. Sometimes it gets buried, but if you use a utensil to sift through it, you should find it in there. To answer your question, one scoop is the equivalent of 2 tablespoons. I hope this helps. I’ve tried 3 different collagen powders. This is the only one that quickly, almost instantly on its own that it dissolves. I started using this one for my thyroid as I have under-active hypothyroid disease. Hands down, this is the best one out there & I highly recommend it as a fully satisfied customer! Thank you Tom. I was giving up on my health after numerous head and neck injuries over 4 years that caused weakness with my whole body. After months of therapy I was ok for a short time until the weakness took over again. When I discovered your hypothyroidism book I realized I was nutrient deprived. I started using your meal plan and supplements especially the Collegen Protein, Pregnenolone and ADK etc… the organic coffee is amazing! My health has been restored and I am working full time again and feeling engerized at the end of the work day. It feels so good to feel good again!